There’s nothing finer on a wintry and cheerless day than a Wadia Brothers Arabian Nights tale brought to you in Glorious Gevacolor! I am pretty sure that an early Nadia stunt film would be equally fine, but until they become readily available these are just the ticket. 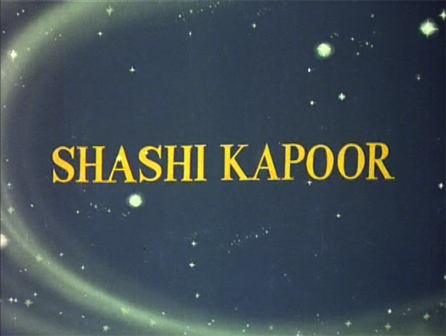 Standard features include feisty beautiful women (and dancing girls) in harem outfits, a swashbuckling hero (and in this one Mahipal is not even girly), kings with evil commanders named Something Beg, scores of caped extras, an intrepid animal companion or two (Zabak‘s is a white horse who doubles as the Comic Side Plot! 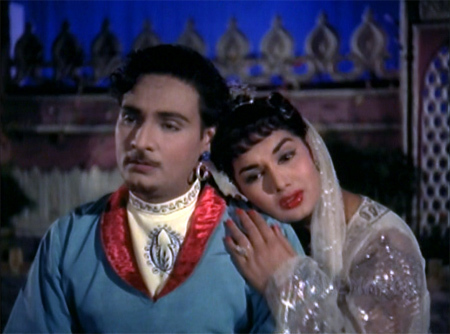 ), lovely songs (by Chitragupta here)—and always, absolutely always, every frame is filled with stuff that I would kill to get my sparkle-loving hands on. Zabak is no exception to my Wadia Brothers Cardinal Rule (which is that the Wadia Brothers…well, RULE). 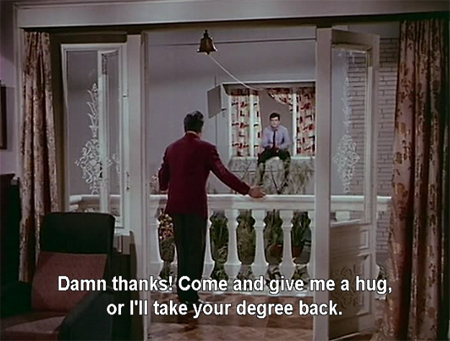 After the trauma of little Master Bunty’s plight in Aakhri Khat, I needed to bask in the manly warmth of Dharmendra’s strong arms and glorious Greek god looks. 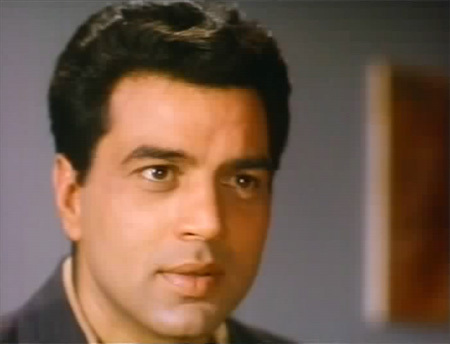 And Dharmendra is pretty much the only thing that got me through this nonsensical film (well, him and Sharmila’s and Mumtaz’s outfits). What a criminally stupid waste of a good cast. 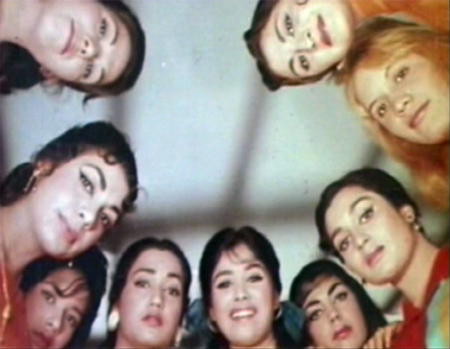 The story, such as it is, isn’t helped by incredibly choppy editing, which can probably be blamed on KMI since Hrishikesh Mukherjee edited the original film and I can’t imagine that he would have done such a hack job of it. Additionally, each character is totally infantile, lacking any kind of self-awareness or empathy for others; not to mention that none of them seem to have been taught that honesty is the best policy. Plus, they are all as dumb as rocks, seriously. It is pitifully easy for them to keep pulling the wool over each other’s eyes. By the end I felt like I had just spent two and half hours in a nursery school housed inside a mental institution. This may be the most aptly named film in the history of cinema. 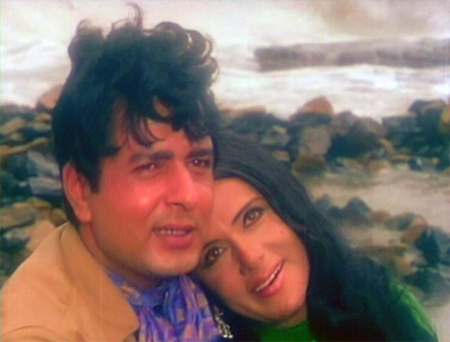 It’s an all-out early Yash Chopra romance: boy and girl fall in love, marry despite opposition, are separated tragically, then reunited—but with big obstacles to their happiness. 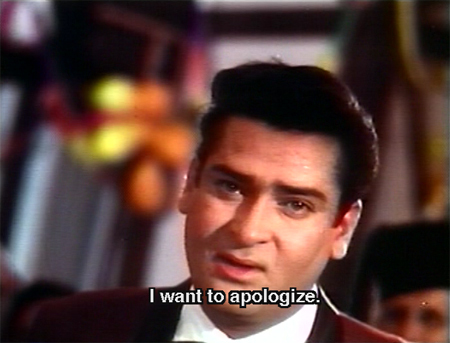 Particularly satisfying are Rajesh Khanna and Sharmila Tagore as said boy and girl. 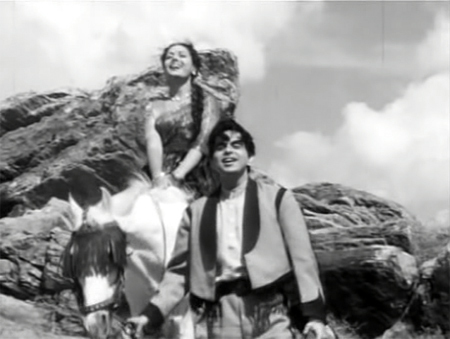 Their performances are enhanced by setting (snowy Himachal Pradesh) and beautiful songs courtesy of Laxmikant Pyarelal with stunning lyrics from the great Sahir Ludhianvi. I—shameless romantic that I am—loved every heartwrenchingly glorious minute of it.